Commitment and perseverance are definitely things you have to have when striking out on your own to produce quality comics. One thing that is overlooked is the strength in unity. When a group of liked minded people join forces, what happens next can be a beautiful thing. When those people are committed and have the perseverance to stick to what they are doing then only good can come out of it. Our next independent creator has been at it since the 90’s. He has been committed to his craft and has persevered, and we are reaping the rewards! We have Quincredible author David Gorden up next. Let’s find out more about him. I’ve been creating comics professionally since the mid 1990’s. I started out as part of an art collective known around St. Louis as Air Assault. We were a group of comic book heads and airbrush artists. During that time we formed another studio dedicated to creating comics called Mach One. We created our own stories as well as being paid to write or draw for different clients. Nearly three years ago members of Mach One went on to form the core of Lion Forge comics and I was brought on to write and draw and here we are today. 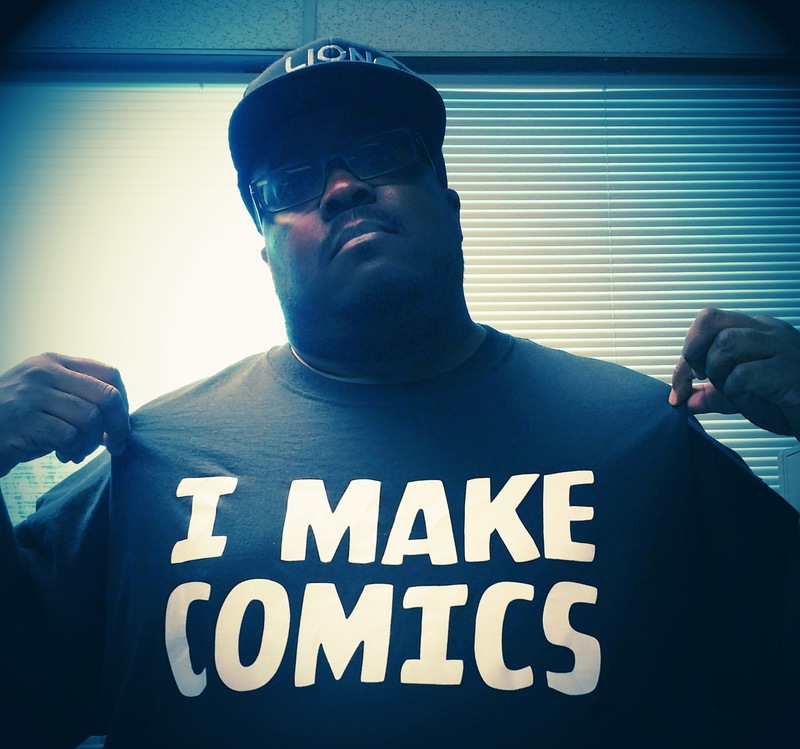 Writing wise my three greatest influences are Chris Claremont, Peter David and Dwayne McDuffie. I think in a way all three of those dudes probably influenced 90% of the industry. Art wise my favorite artist and biggest influences are John Buscema, Joe Madureira, Humberto Ramos and Mike Wieringo. I’m kind of all over the place. Right now I’m working on Trimaxx, Quincredible, Rampage Jackson, Bulletproof Knights, Crimson Baroness and we just wrapped up my first story arc for Airwolf. I didn’t start seriously collecting comics until my sophomore year in high school. That’s when I started collecting The Avengers and then I started collecting books like Uncanny X-Men, Wolverine, The Incredible Hulk, and Spiderman. This was around ’87 – ’88 around the time when Todd McFarlane, Marc Silvestri, Jim Lee, Rob Liefield and all those Image guys were getting going with their classic runs on top tier Marvel books. I guess the one character I would love to rewrite and kind of redefine would be Luke Cage. I think Luke gets a bad rap as nothing more than an exploitation character from the 70’s, just another shady black dude that could only get his powers after doing a stint in jail for you know being black…Yet if you look at the guy he’s got a lot of potential and I would love to take a crack at him and kind of removing the stigma from him. Pretty much our entire roster of books at Lion Forge. Quincredible is an amazing character and I think in the upcoming stories I have him in people will realize his appeal. Night Trap by Cullen Bunn could be made into a movie right now. Wonderous by Joelle Sellner is a super heroic romantic comedy with so much heart it’s crazy. Rampage is already a media darling and I think that Trimaxx and Roboy have huge cross over potential! Whatever you start finish it. That was a big deal for me. For a long time I wasn’t finishing my projects. Then when I started finishing what I started and seeing it through to the end things began to move forward. Basically finishing a project ties into you just believing in yourself and your ideas. Even if your idea seems like it’s the dumbest thing you’ve ever thought up it’s best to work it out and see it through to the end. You never know who may be looking at it. Yeah I got a list (laughs)! Brian Stelfreeze, Larry Stroman, Mark Brooks, Sanford Green, Humberto Ramos, Dextar Vines, Marc Silvestri, Rick Leonardi, Stuart Immonen and Joe Madureira. Honestly the list could go on for days. Most are people that I have met or really admire and just would love to do something cool with. Well anyone of our books from Lion Forge but outside of that I would love to see Watson and Holmes as a movie or maybe a television series. Chris Walker’s upcoming Tiger Style would make a great movie. Concrete Park would be an interesting adaptation as well. Learn more about David Gordon below! Read the most in depth Quincredible biography HERE! 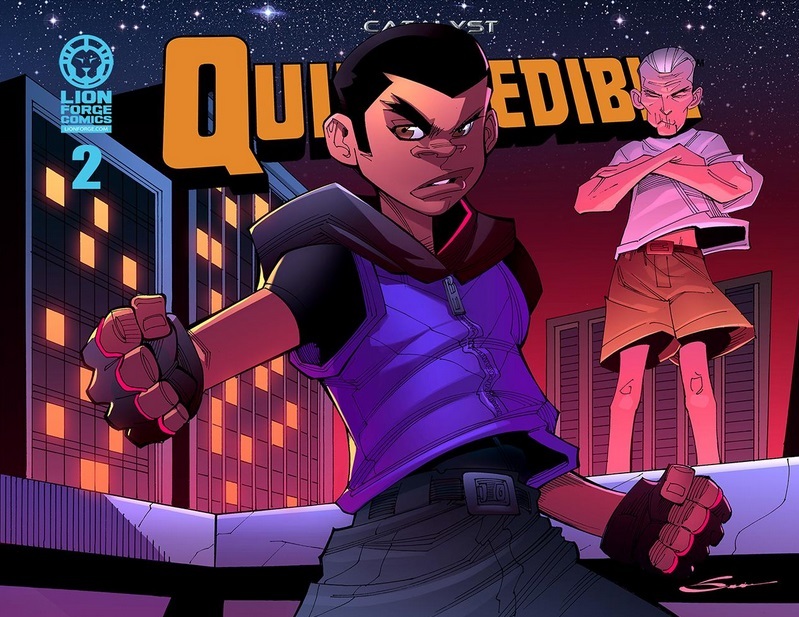 Read our Quincredible #2 Review HERE! Read our Quincredible #3 Review HERE!